What’s the most valuable asset to a pilot? Many would probably tell you time, especially when there’s a business interest involved. For most pilots, getting from point A to point B as safely, quickly and efficiently as possible is the main objective. Fortunately, we have a tool that can help. Our built-in Pre-Departure Clearance (PDC) services on FltPlan.com were created to help flight crews and passengers save valuable time, allowing them to get airborne, and ultimately to their destination, faster and more conveniently. What’s the Advantage of PDC? It’s easy – simply submit a flight plan for approval within FltPlan.com, and an approved PDC will appear for an active flight approximately 20-30 minutes before your filed departure time. PDC notifications can be received via email, text or as a pop-up that opens in a separate window when the PDC message is displayed on a pilot’s active flight plan list within FltPlan.com. PDCs are a great solution for aircraft that aren’t equipped with controller-pilot datalink communications (CPDLC). 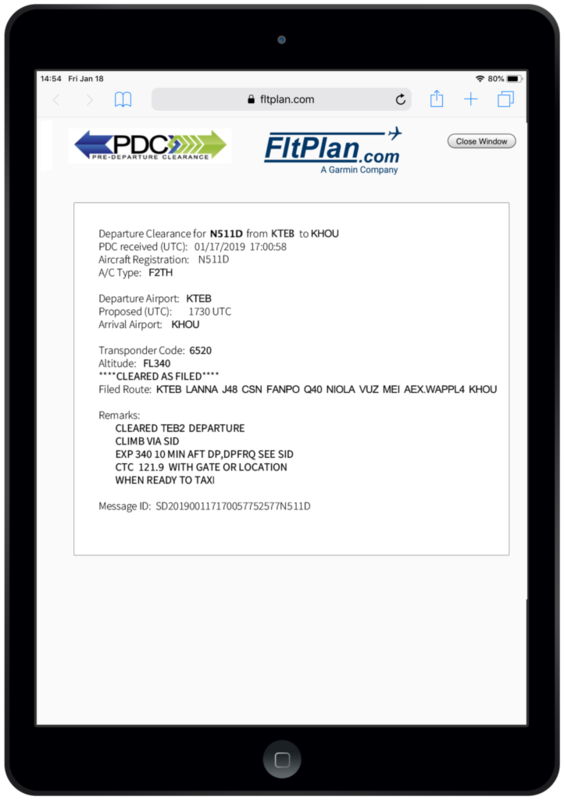 Pilots have access to PDCs on a mobile device running FltPlan.com, or by receiving PDC information via text and email notifications.